Find out more about our executive management team. Christopher Luxon has been Chief Executive Officer since 2013 and under his leadership the airline has delivered record profits, all time high customer satisfaction scores and achieved its highest levels of staff engagement. Alongside this, Air New Zealand has won numerous accolades, including several celebrating it as the best airline in the world and others recognising its commitment to key areas such as sustainability, innovation, corporate reputation, employee engagement and customer experience. Air New Zealand operates a global network that provides air passenger services and cargo transport services to, from, and within New Zealand to more than 17 million passengers a year. Its strategic focus and competitive advantage are within the Pacific Rim. The company's network expands from New Zealand to Australia, the Pacific Islands, Asia, North America, South America, and the United Kingdom. 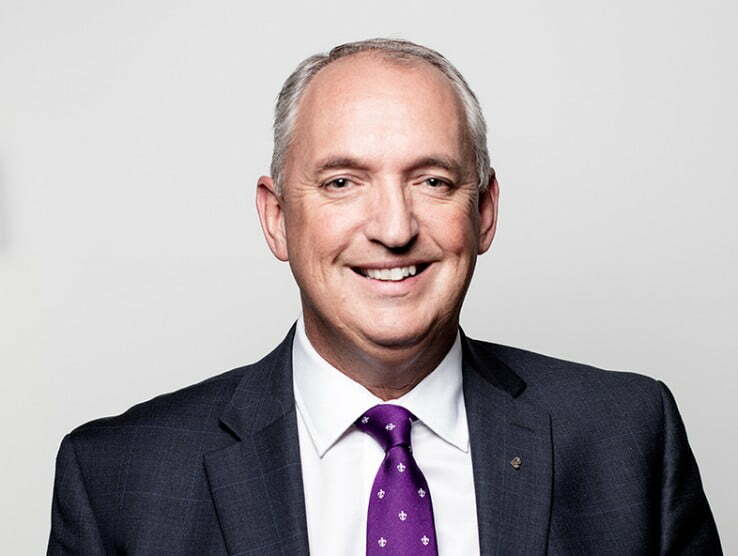 Prior to joining Air New Zealand, Christopher was President and Chief Executive Officer at Unilever Canada. This was one of several senior leadership roles he held during an 18-year career at the multi-national that saw him work in roles in Europe, North America and Asia/Pacific. Christopher has a Master of Commerce in Business Administration from the University of Canterbury. Mr Luxon also serves as Chairman of New Zealand Prime Minister Jacinda Ardern's Business Advisory Council. Jeff McDowall joined Air New Zealand in 2000 and was appointed Chief Financial Officer in January 2018. Prior to this position he held a range of senior commercial and finance roles within Air New Zealand including Group General Manager Corporate Finance where he was responsible for Corporate Finance, Treasury, Fleet Strategy and Investor Relations; and Group General Manager Commercial, with responsibility for pricing, revenue management and ancillary revenue. Jeff has worked in a variety of businesses during his career, including six years as a management consultant with PwC in New Zealand, Singapore and the United States, and three years with Mobil Oil in New Zealand and the United Kingdom. Jeff has a Bachelor of Commerce and Administration from Victoria University, is a member of Chartered Accountants Australia and New Zealand and a certified member of the Institute of Finance Professionals NZ. Jodie King joined Air New Zealand in 2012 as an HR General Manager and member of the HR Leadership Team after 16 years of living and working in the UK. Jodie was appointed Chief People Officer in February 2016. Prior to this she had managed Air New Zealand's Organisational Effectiveness and Talent, HR Corporate and HR Airports and Sales and Commercial teams. During her time in London Jodie worked at KPMG in leadership and management consultancy roles across a range of industries, including infrastructure, oil and gas, banking and retail with companies like London Underground, BP, Royal Bank of Scotland and Diageo. Her last role at KPMG saw her as Director of Talent Management across nine European countries. Prior to KPMG she worked for New Zealand Treasury and NZ Dairy Co-operative after graduating from Otago University with an Arts and a Commerce degree. Cam was appointed as Chief Revenue Officer in January 2014 and is responsible for generating Air New Zealand's passenger and cargo revenue, currently a portfolio with a turnover of $5 billion. His responsibilities include revenue management, global pricing, online sales, grabaseat™, retail marketing, corporate, distribution, government sales and contact centres. In this role, he leads a team of General Managers with over 1,500 employees in total across his portfolio, based in New Zealand and other international markets, including Australia, North America, Argentina, Singapore, China, Japan, the United Kingdom and Europe. Cam joined Air New Zealand in 2001 and has held a number of senior positions in the airline including Group General Manager New Zealand and Pacific Islands and General Manager Australia. Cam has completed business management programmes at Darden School of Business, Kellogg School of Management - Northwestern University Chicago, and the London Business School. Most recently he studied at INSEAD, France, where he completed the Advanced Management Programme. Nick Judd was appointed as the Chief Strategy, Networks and Alliances Officer in October 2017 and leads Air New Zealand's four Joint Venture Alliance partnerships, the Star Alliance relationship and the Sustainability and Transformation portfolios. He has worked across a number of functions and regions in the business beginning his Air New Zealand career in Finance, before holding senior roles in Loyalty, Sales and Commercial areas across Australia, China, America and New Zealand. Nick joined Air New Zealand in May 2003 after returning to New Zealand from working in the United Kingdom and Canada in finance roles for companies such as Chase Manhattan Bank and News Limited. Nick is a Chartered Accountant and holds a Bachelor of Management Studies (Hons) from the University of Waikato. Mike has responsibility for Air New Zealand's global marketing and its customer experience related functions together with accountability for Corporate Affairs, Government Affairs and Industry Relations, Sponsorship and Community Partnership programmes. Mike was previously General Manager of Marketing and Communications and prior to that General Manager of Communications. He joined Air New Zealand from Fonterra where he held the roles of Assistant to the Chief Executive Officer and Shareholder Communications Manager. Prior to these roles he held senior positions with Television New Zealand and in the print industry. Mike is a Fellow of the Chartered Institute of Marketing and a graduate of Harvard Business School's Advanced Management Programme. David joined Air New Zealand in 1985 after a career in general aviation and subsequently joined the Flight Operations management team in 1996. David has held various senior operational management positions and was appointed to the Executive in 2008. In his current role David is responsible for determining the Flight Operations policy, standards and procedures by which our aircraft are operated, and is accountable for operational safety. John joined Air New Zealand in 1985 and has held many senior leadership positions across the airline. These include General Manager International Operations (Pilots and Airports), General Manager Domestic Airline, General Manager Loyalty & Alliances and General Manager Mount Cook. More recently, John was Group General Manager Airports and led a team of 2,500 airport and lounge employees in more than 50 locations around the world. He has a Bachelor of Commerce from the University of Canterbury. Carrie Hurihanganui was appointed as Chief Ground Operations Officer in 2018. She is responsible for our Airports, Engineering & Maintenance and Business Performance teams. She has deep strategic and operational experience through her 18 years at Air New Zealand in numerous senior roles, including General Manager Eagle Air, General Manager Offshore Airports, General Manager Customer Experience, and Group General Manager Regional Airlines & Airline Operations. Carrie left the airline in 2017 to join National Australia Bank (NAB) based in Melbourne as Executive General Manager Customer Experience before returning in 2018 to her current role. She has a Bachelor of Business Studies from Massey University.